Features: Real Leaves or Custom Stencils, Embossments, Monotype, One-Of-A-Kind, Custom Colors, Archival Paper & Ink. Monotype: Rolled colors and textures on a plexiglass plate transferred to heavy archival paper via a hand-cranked heavy duty printmaking press. Features: Same Price As Pre-Made Pieces, Patron Ordered Color, Patron Ordered Subject, Patron Ordered Size, Patron Ordered Archival Paper Color, Monotype or Aquatint, One-Of-A-Kind, Custom Colors, Archival Ink. Aquatint: Acid applied to a metal zinc plate with custom colors spread over the plate and transferred to heavy archival paper via a hand-cranked heavy duty printmaking press. [Left] - "BLUEPLE" - Aquatint - Custom color over acid etched zinc plate. [Right] - "PURRNICIOUS" - Monotype - Custom subject: cats. Features: Full Paper Coverage, Monotype, One-Of-A-Kind, Custom Colors, Archival Paper & Ink. 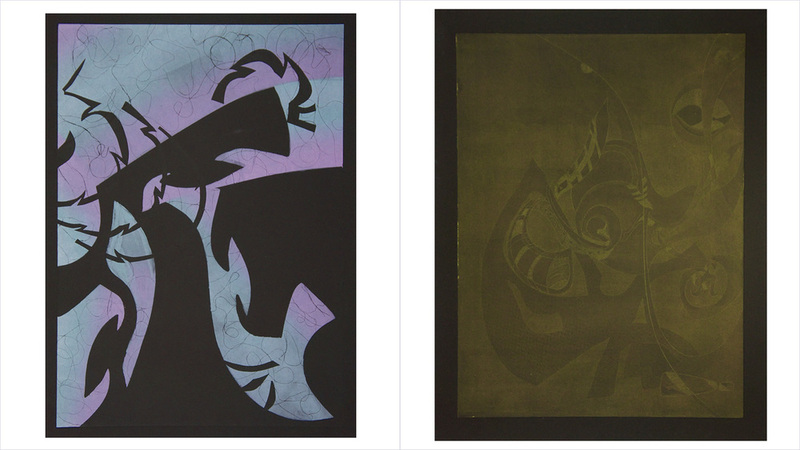 Features: Black Archival Paper, Monotype or Aquatint, One-Of-A-Kind, Custom Colors, Archival Ink. Features: Collaged Handmade Stencils, Monotype or Aquatint, One-Of-A-Kind, Custom Colors, Archival Paper and Ink. Features: Layered Techniques, Monotype over Aquatint or Monotype over Monotype One-Of-A-Kind, Optional Collaged Handmade Stencils, Optional Acrylic Highlights, Custom Colors, Archival Paper and Ink. 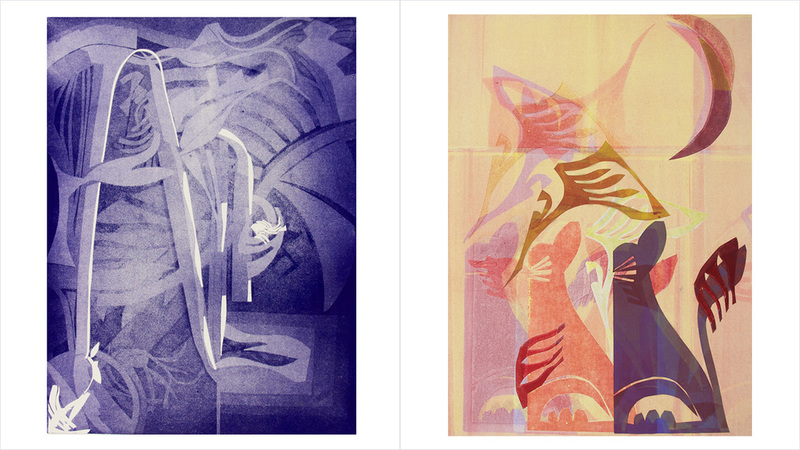 Features: Monotype or Aquatint, One-Of-A-Kind, Custom Colors, Archival Paper and Ink.